Holt Selection Day: All You Need To Know! Last week was a key milestone for the entire Holt team. After several months searching far and wide for the most innovative fintech startups across the globe to join our accelerator program, we finally had our highly-anticipated ‘Selection Day!’ The 2 day event, held in the beautiful and fitting setting of L’Espace CDPQ, Montreal, welcomed 34 international startups who were chosen from the 400+ total applicants we received to pitch for our team of over 60 mentors. We were thrilled that so many of our trusted partners, advisors and chosen startups joined us for the special event, particularly those that had travelled so far and were perhaps suffering from a little jetlag! It was incredible to bring all of these brilliant minds together for 2 days of impressive pitching, engaging conversation and networking with those that share a passion for fintech and the exciting buzz that is swirling at the moment in the community. What did Selection Day entail? Each fintech team was allocated a table for the session. The mentors were then divided into groups of 5/6 and spent just 13 minutes at each table hearing from the teams before moving onto the next startup to pitch — call it fintech speed-dating! With such a short time in which to impress, the competition was tough from the getgo! Day 1 ended with a cocktail networking event organised by FinFusion, held on the stunning rooftop terrasse of the Place D’Armes Hotel, where drinks flowed and conversations continued after a successful first day. Day 2 commenced bright and early to hear from the remaining 16 teams still left to pitch. It followed the same format as day 1 to ensure everyone was getting an equal opportunity to impress our panel of mentors, and it did not disappoint! By the end of the event, there was one clear conclusion… fintech innovation is not slowing down anytime soon! From the fintech teams’ perspective, the event presented a unique spin on a pitch battle and provided the opportunity to meet with our mentors whose invaluable expertise will be helping the final 10 teams accelerate to success. 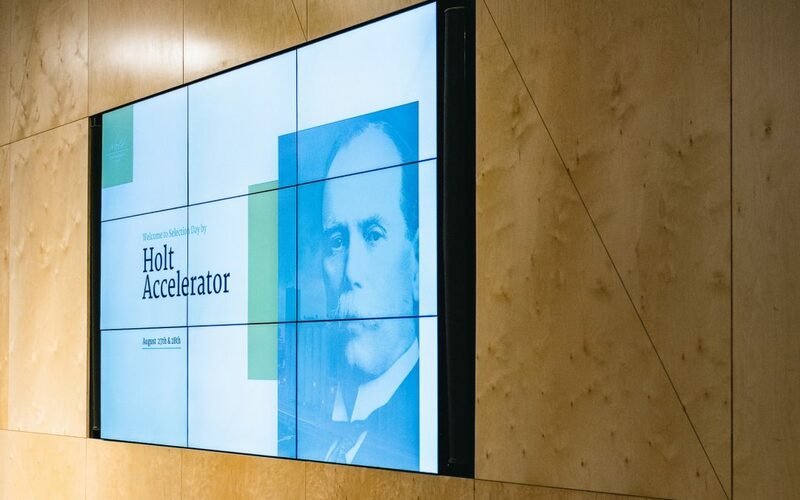 The final 10 teams for the Holt Fintech Accelerator will be announced very shortly… watch this space!